Starting September 11th 2017 Email to register an interest & receive further details. This is gentle stretching and breath work, ideal for new mums (6 weeks after baby) for repairing C section (12 weeks after baby), recti diastasis, for those who wish to improve core strength, general flexibility, aiding relaxation, reducing Stress and can help a good nights sleep. This yoga starts with primary series and sun saluatations and its teaching are direct from India. This course will empower you to practice yoga anywhere, as often as you like to gain stamina, fitness, flexibility and strength while reducing stress levels & learning to breath. Men only Yoga classes after work, so you can gain fitness, strength and flexibility while learning to do this form of moving meditation. Reduce stress, learn to relax while becoming healthy. Yoga is Good for the Mind Body & Soul. Register an interested as course numbers restricted to small group. Please email me for further details as classes are pre-booked, drop in spaces may or may not be available. No matter what age, ability or fitness level. 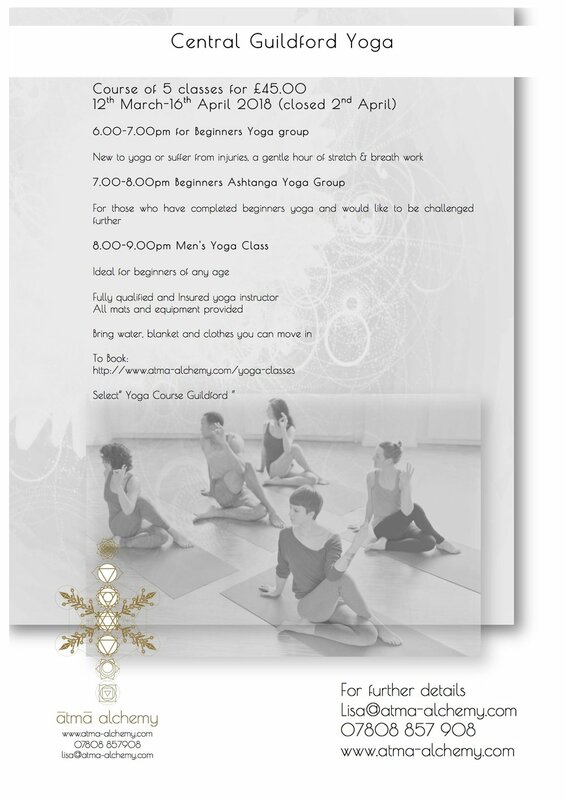 Fancied trying yoga but would like a small class of absolute beginners to do it? Strengthens core & builds muscle strength, lengthens & stretches muscles, relaxes and de-stresses the body. Returning from Maternity leave & an additional 85 hour Yoga alliance course, I am excited & refreshed to beginning Yoga lessons, meditation groups & sharing the lovely Kahuna Massage. Small friendly classes in the center of Guildford, please MSG, email or call to book as space, as class sizes are limited. After 8-12 weeks spent at home (*please check with Doctors that you are ok to start an exercise routine) with your new baby, post recovery from birth & adapting to having a new soul to care for, this classes will aid you gaining strength, building up flexibility and and aid post labour recover.